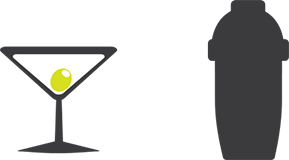 Kobas has a suite of tools that allow for stock to be completely centrally controlled, recording and reporting from supplier to plate. This post gives an introduction to how a Central Kitchen can be established and maintained in Kobas Cloud, giving your staff access to simple stock management and accurate reporting. We’ve covered before how to manage ingredients and products (sometimes called ‘Batches’) efficiently. Operating a central kitchen allows you to order Flour (Ingredient) from an external supplier, use this ingredient to make Bread (Product), which can then be transferred to your venues and used to create a Bacon Sandwich (EPoS Item). This life cycle means that each time one of your venues sells a Bacon Sandwich, the usage of Bread, and therefore Flour, is recorded. This provides for accurate reporting on stock usage, as well as Cost of Sales and Operational Profitability. Best of all, as all stock is controlled centrally, it means that any change in recipe, or fluctuation in ingredient cost, is automatically calculated without your venue staff having to change anything. This system allows your operational staff to directly handle your operations, and for your venue staff to tend to your customers, saving your team valuable time. Stock Transfers behave in the same way as normal deliveries in Kobas, the only difference being that instead of recording a price paid for the ingredients, the value of the transferred stock is moved from the providing store to the receiving store. 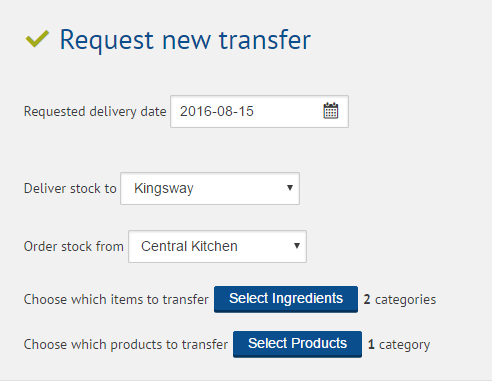 When placing an ‘order’ from your Central Kitchen, the receiving venue will be able to view exactly how much stock the kitchen currently has, informing their decision and minimising the chance of over-ordering and the kitchen being unable to fulfil the request. You can check the theoretical stock levels of your Central Kitchen at any time by checking the Stock Current Position report. The Stock Transfers report provides a simple method of overseeing all stock movement, which displays all transfers made between venues, across any period of your choosing. This report gives you a snapshot of the total value of transferred ingredients and products, as well as a detailed breakdown of each individual transfer, making it ever easier to keep track of exactly where your stock is at any given time. For instance, if one of your stores is seeing an unusual usage variance, you can instantly see if a transfer has been missed off. It’s also possible to see any patterns that arise in a particular venue’s transfer habits, allowing you to preempt any shortages, or ensure efficiency by not over-ordering stock that will then be wasted. If you would like to set up a Central Kitchen in Kobas Cloud and you would like some pointers, please get in touch at support@kobas.co.uk.